The Short Version: Going on fantastic dates with attractive people is a luxury you can afford when you have a personal matchmaker by your side. Elegant Introductions personalizes and accelerates the dating process by arranging compatible, vetted dates between eligible men and women in South Florida and Boston. Led by skillful love experts Nancy Gold and Barbara Black Goldfarb, the boutique matchmaking firm empowers singles to become the best version of themselves and meet high-caliber date prospects without all the effort and frustration of traditional dating methods. The hands-on matchmakers help high-profile professionals feel comfortable and confident when going out on dates in search of a relationship. From start to finish, Elegant Introductions’ clients enjoy a stress-free dating experience supported by thoughtful and dedicated matchmakers. A few years ago, Gary Robinson felt utterly fed up with the traditional dating process. He was tired of meaningless dates and online dating. He came to Elegant Introductions, a Miami-based matchmaking company, because he was ready to invest in love and let the professionals do the work for him. Longtime friends Barbara Black Goldfarb and Nancy Gold founded Elegant Introductions in 2012. So Gary met with Elegant Introductions Founders Barbara Black Goldfarb and Nancy Gold, PhD, to discuss his relationship goals. The matchmakers took copious notes and expressed confidence that they could find him a quality woman. His first arranged date blew him away. Four months later, Gary wrote to the matchmakers to say he was in a committed relationship with her, and they were planning to move in together and get married within the next year. “Seems like Barbara and Nancy did right by us,” he concluded. In 2012, Barbara and Nancy, who have been friends since childhood, decided to combine their strengths and talents to brings more love into the world. Barbara’s personable charisma and human intuition complements Nancy’s educational background in psychology and relationship consulting, so matchmaking seemed like a natural fit for them. This dynamic duo founded Elegant Introductions to serve as a support system, wingwoman, and love expert for singles, like Gary, who want to get in a relationship but don’t know where to find that special someone. Known as South Florida and Boston’s premier matchmakers, Elegant Introductions cultivates a well-educated and successful clientele who set high standards for their personal lives. The majority of clients are working professionals ranging in age from their early 20s to early 80s. These relationship-minded adults typically don’t have the time or inclination to scour the dating world for the perfect match, so they choose a more personalized and targeted approach through the boutique matchmaking firm. 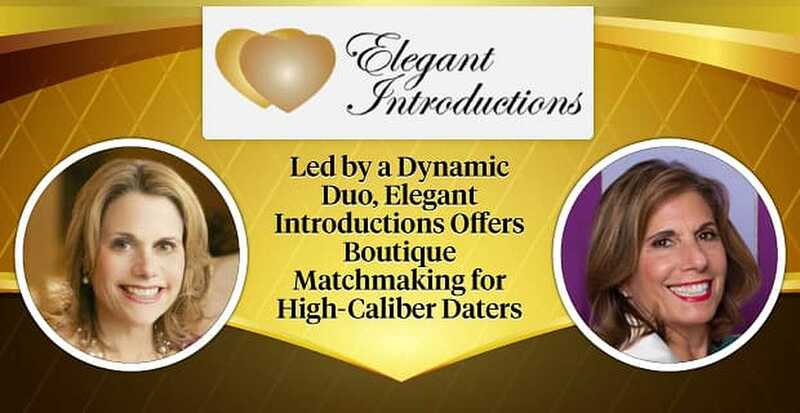 The matchmakers at Elegant Introductions don’t just throw men and women together and hope it works. They take their time and carefully consider each pairing. They don’t focus on the quantity of matches because the team doesn’t force matches for the sake of meeting a quota. Each introduction they make is a highly qualified potential match. If they arrange a date for you, it’s because they have good reason to believe you’ll hit it off with that person. Elegant Introductions uses a straightforward four-step process to pair singles. The matchmaking team is hands-on with clients every step of the way from the introductory meeting to the post-date feedback session. They screen date prospects for compatibility, conduct background checks, and support an effortless dating process. The matchmakers even recommend date activities ranging from a simple dinner to a more active walk in a local park. Barbara and Nancy told us they put the needs of their clients first and go to great lengths to remove the anxiety, stress, and labor involved in the search for a committed relationship. Busy professionals often find Elegant Introductions to be a time-saving solution to their dating obstacles. Feedback is vital to Elegant Introductions’ matchmaking process. That’s why they take the time to get in touch with both clients after the arranged date to see how it went and learn from their first impressions. That conversation gives them unique insights into the dating experience, so they can provide personalized dating coaching to clients who have room for improvement. Nancy is a Harvard-trained licensed psychologist with more than 25 years of relationship consulting behind her. She takes a holistic approach to matchmaking, teaching effective dating and interpersonal skills while arranging dates. Elegant Introductions endeavors to set clients up for success on every date going forward. To that end, the matchmakers employ personalized dating coaching to tweak any bad habits. Their confidential and engaged feedback system gives singles additional confidence that they’re doing and saying everything right to make a proper match. Whether they’re arranging dates between two people in their database or going out on the town to scout for a compatible match, the Elegant Introductions team doesn’t cut corners when helping men and women find love. These modern-day matchmakers create long-lasting connections between clients based on their own gut instinct and love intuition. They don’t rely on algorithms or formulas to pair people up. Nancy and Barbara take a more old-fashioned approach, putting a lot of personalized thought and care into each match. More often than not, clients come away from dates saying it was a good fit. Some even find themselves sitting across from The One. You can read dozens of glowing testimonials, like Carol’s, on the Elegant Introductions website. From CEOs to nurse practitioners, entrepreneurs to retirees, all sorts of sophisticated singles turn to the matchmaking firm because they’re tired of the dating game and ready to settle down. The Co-Founders told us one of their favorite success stories involved a widow who thought she’d never find someone who could measure up to the love of her life and a divorced man who said he didn’t want to get married again. The couple met on an arranged date and brought out the best in each other. As they dated, they healed one another’s broken hearts and were married within a year. Gary invested in love when he asked the Elegant Introductions team to fix him up with a date, and today he’s reaping returns as a happily married man. He went from frustrated single to love-struck couple in the course of a few arranged dates, becoming one of many success stories made possible by the experienced matchmaking team. At Elegant Introductions, single men and women receive personalized attention and hands-on feedback to make their dating experience go smoothly. Nancy and Barbara scour the dating field to arrange matches who have genuine long-term potential. Having such caring matchmakers curate and verify your dates takes the anxiety out of meeting new love interests so you can simply show up and have fun with someone who fits your lifestyle and values. For more information, visit ElegantIntroductions.com or call (305) 615-1900.